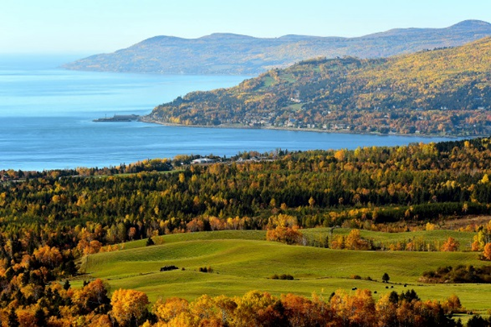 Our post-symposium excursion will allow you to discover the spectacular Charlevoix region, located on the north shore of the St. Lawrence River. This dramatic landscape is composed of rolling hills, fjords, headlands and bays and was designated the World Biosphere Reserve of Charlevoix by UNESCO in 1989. The first day, we will start in the afternoon and follow the St. Lawrence River and take the ferry to the island of Isle-aux-Coudres. Discovered in 1535 by French explorer Jacques Cartier, this magnificent island occupies an area of 30 km2. Its name originates from the many nut-bearing trees on the island, coudrier in French (Corylus cornuta), for hazel tree. 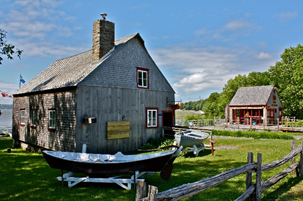 The first family settled on Isle-aux-Coudres around 1720. At that time, the islanders lived in completely autarky (self-sufficiency); today there are 1279 residents on the island. That charming and unique hotel was built in 1930 on Isle-aux-Coudres and is named after a legend (that you will discover on the island). The decoration brings back the memory of French Canadian ancestors’ customs and habits. Visitors will have access to the salt water pool. Bicycles can also be rented at the hotel to discover the island on your own. It is in 1918, when the Pedneault family planted the first 300 apple and fruit trees on its ancestral land of the island. Today, this family enterprise owns more than 1200 fruit trees in its orchards and offers a large selection of prize-winning ciders and other alcoholic and non-alcoholic products processed from their own fruits. Back on the mainland, on our travel to Tadoussac, we will make a halt in the picturesque village of Saint-Irénée to visit the art studio Les Ateliers DeBlois. This well-known art studio features since 1985 the exclusive work of Joan DeBlois and Stéphane Bouchard, including everything from functional pottery to Raku (a Japanese style of firing). At the confluence of the Saguenay and St. Lawrence rivers, Tadoussac was a favourite meeting point among First Nations from the North and South. It was a place of barter where northern fur would be traded for southern products such as tobacco, corn, tools and adornments. The Montagnais (native peoples) would call it Totouskak, because of the granite mounds that rolled on the west side of the village. It was at that very spot that New France was born, when Pierre de Chauvin founded the first French trading post in 1600. 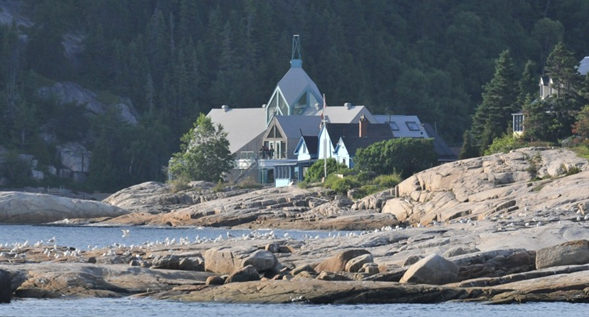 To this day, Tadoussac remains a major jewel among Québec heritage sites. It is still a place of global convergence for visitors who want to get in sync with the St. Lawrence’s tide and eavesdrop on the echoes of moaning whales. Overlooking the majestic Tadoussac Bay and the St. Lawrence River, the hotel officially opened its doors to the visitors in 1865, marking the beginning of vacationing in the region. With its whitewashed walls, red roof, maritime colours, dormer windows and cupola, the hotel calls to mind an earlier era. For thousands of years whales (e.g. blue whales, humpbacks, fin whales, mink whales, and belugas) have come to the St. Lawrence River in the Tadoussac area. They spend the summer diving to the bottom of the river to feed on the rich marine life before migrating to the Atlantic Ocean in the fall. 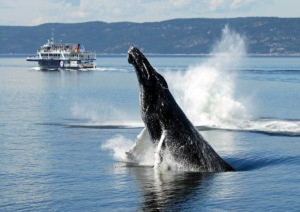 In the morning, we will participate on a 3 hour whale watching cruise on the St. Lawrence River. 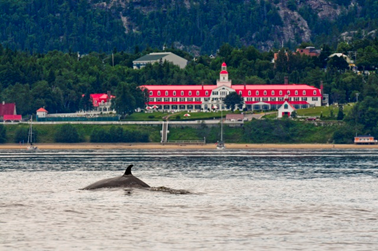 After a lunch break at Hôtel Tadoussac, we will visit the Saguenay-St. Lawrence Marine Park in the afternoon, with its Interpretation Centre of marine mammals and the Archeological Centre of the human occupancy of the North Shore. On our way from Tadoussac to Baie-Saint-Paul, we will make a side trip to the Parc national des Hautes-Gorges-de-la-rivière-Malbaie. 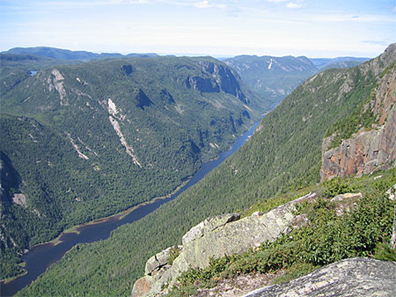 The name Hautes-Gorges of this national park refers to the valleys that are deeply entrenched and surrounded by high mountains (formerly fjords following deglaciation). This site is amongst the highest peaks to the east of the Rocky Mountains. The significance of the slopes, the scenic beauty and peculiarities of the Malbaie river make this site an enchanting environment. This park has the privilege to be one of the main areas of the Biosphere Reserve of Charlevoix. Visitors will have access to hiking paths, canoe, kayak or bike rental, or pay for a memorable boat cruise on the Malbaie river. 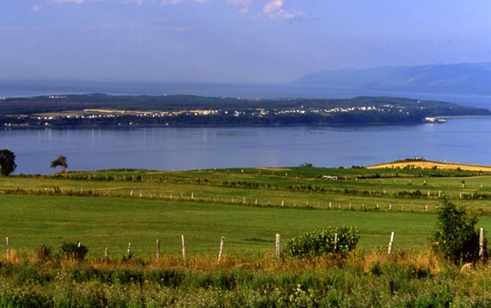 Baie-Saint-Paul was first colonized in 1678. Three century old mansard-roof houses can be seen on rue Saint-Joseph. But the modern-day heart of the village beats on rue Saint-Jean-Baptiste, in the variegated colors of the twentieth century dwellings. A thriving cluster of art galleries, shops and artist workshops bear witness to the vitality of this quaint Québec town. 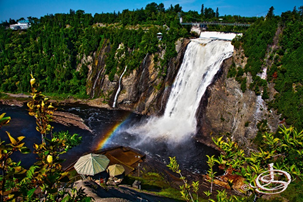 On our way back to Québec City, we will visit one of the most spectacular sites of the Province of Québec, the Parc de la Chute-Montmorency. With a height of 83 m, i.e. 30 m higher than the Niagara Falls, this impressive waterfall dominates the scenery. This island in the St. Lawrence River is the cradle of French civilization in North America. Three hundred founding families established roots on Île d’Orléans. 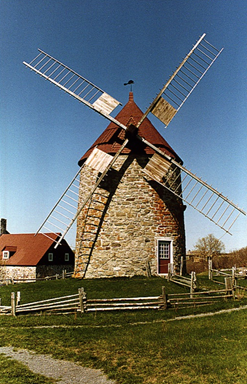 The island has been described as the "microcosm of traditional Québec and as the birthplace of francophones in North America". Inhabited since time immemorial, Île d’Orléans offers gorgeous scenery stretching along the banks of the St. Lawrence River. Return to Québec City around 16h00.